Last weekend did some cleaning and when Papa came back from work we kinda last minute decided to go off some where. North East West South. North won. Traffic was heavy but not that bad . Fuih...finally arrived. Walk-in but luckily there are rooms available. Next....must cari makan. Whole day didn't really eat much leh. Only a bit of noodle in the morning . Mamarazzi's mind numbed liao. Where to eat ah? Pakai hentam go back to Kafe Sun Yoon Wah la. We visited the place back in 2012 and the food was good. This round didn't ordered any Snow Beer. Just plain Chinese Tea. Wah....they even give the whole thermos of hot water for us to self service refill. Mamarazzi said very long time she had not seen this type of thermos. The top looks like a knight's "helmet". 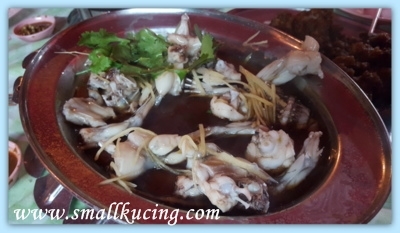 Steamed Frog with Chicken Essence. But Mamarazzi bluff me say it's chicken . My plate of Wat Tan Hor. How was the food there? Dunno la...maybe we were tired or maybe it was the Chef's night off ...the taste just was...let's just say Mamarazzi's expectation is a bit higher than that. Price wise...needless to say is different from what it used to be la. 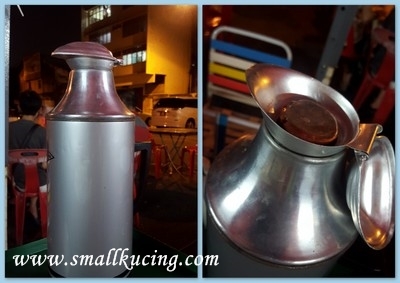 Wah, long time I no see people give 1 big flask to refill our own hot water jor leh..Normally we ask the people there to do hor.. Steamed frog with chicken essence? Never had that before, but I reckon it must be very "bou"..
ya lo...very long time never seen this flask before. Ya...you love noodles!!! 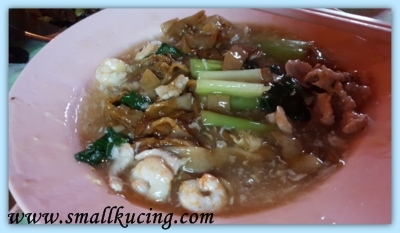 Come to Sibu, long time no eat kampua mee lor... Yum yummmm!!!!!! Apuuuuu!!!! 3 months expire liao lor, no preservatives one!!! Steamed frog is the attraction for me!! Must be tired from the long drive. Nothing much to shout about huh?? 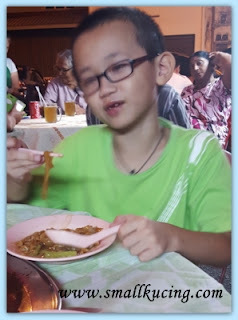 opppsss...tarak say "nothing much to shout about" ah... might be tired from the journey so did not enjoy the food too much gua. Mantis Prawns are tough characters in the wild, could break a person's finger! Trip was great, but being without internet made me miss you and all my friends! Frog and pork is always good if prepared right, lil kitten ... never be afraid of that ... cuz tastes good with lot's of garlic and curry ... and potatoes, lil noodle man you ... smiles ... Love, cat. 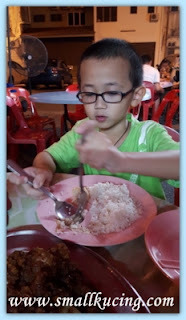 I also very like wat tan hor. But frogs ah, not much meat to eat. Lol....good lo so that won't be too filling. wah, Paparazzi very on leh, came back from work and straight away wanna go on a spontaneous cuti-cuti Malaysia.. last minute one sure more exciting huh?? hehe.. so north the Kucing Family went to Ipoh for Merdeka celebration!!! Wahhhh the highway photo look quite jam lah..
A lot of cars but it's moving. 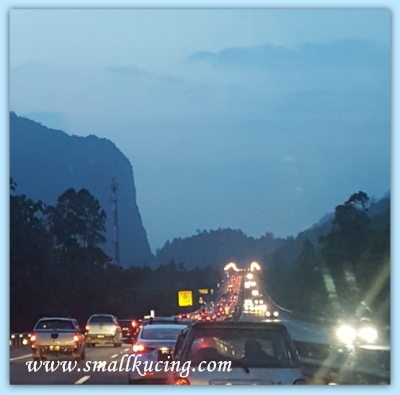 Only jam about 20-30 mins when near Ipoh. wah lucky leh, went there without booking a room and good that Mamarazzi was still able to get a room walk-in.. maybe not many people going to Ipoh for holiday, because they all went to KL for some events kot?? 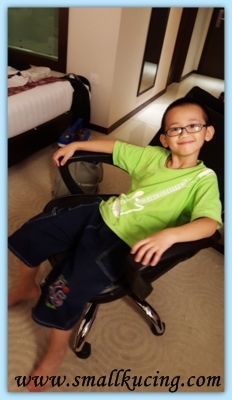 the room looks nice also woh, macam 5-star hotel dei but why Mamarazzi did not tell which hotel that was?? Ipoh also have cleaning activity kihkihkih. Rooms ok la but the service kantoi leh. The next day tarak clean the room though we got put sign there in the morning before go out. Come back late afternoon, room still not cleaned. Evening go out...called house keeping to clean. Come back near midnight, room still not clean. Tarak replenished toiletries and drinks. The complimentary breakfast "nothing to shout about". Hence lazy to give them free advertisement la. hahaha, one whole thermoflask of Chinese tea, that is indeed very interesting, but wonder how much the Kucing Family could finish only, hehe.. the food looks good woh, Uncle SK eyeing on the octopus and mantis prawns leh.. but then as per Mamarazzi's comment, hmmm, maybe due to the Chef heading south to KL for some cleaning activities?? and the price also sure not the same as three years ago dei~~ haha!! The flask was hot water. Sendiri tambah if want. The food doesn't look too bad actually. Maybe you were too tired. Hopefully the next few meals justify your trip there. Oh, they still use the old fashioned flask! 2012 is quite a long time since you last ate there. I think I prefer noodles too. 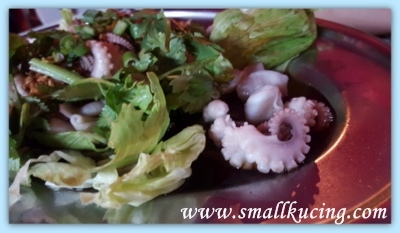 In the end did Small kucing find out that it is frog not chicken? Spontaneous trips are fun! I never did it before. Nowadays most of the restaurants have self-service for hot water! Quite unique dishes. Of course I am loving all of it. Walau Eh!!! You guys ate so much for 3 pax? 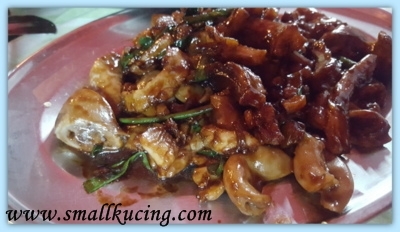 I love that frog legs and Wat Tan Hor. I normally ordered for my lunch and asked the chef to throw 2 eggs in. The marmite mantis prawns is lovely and yummy! 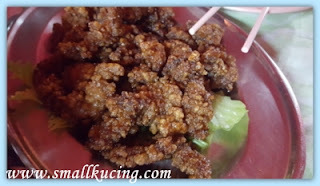 For the fried pork intestines, it is a new thing to me. Next time I must try la. Papa Kaldip must treat me yeah!!! HAHAH! 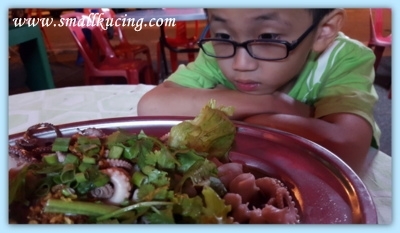 My parents used to bluff me the same way mamarazi did in order to persuade me eating frogs! I was excited at that time and devoured the "chicken meat" only to realize that it was nothing similar to chicken!